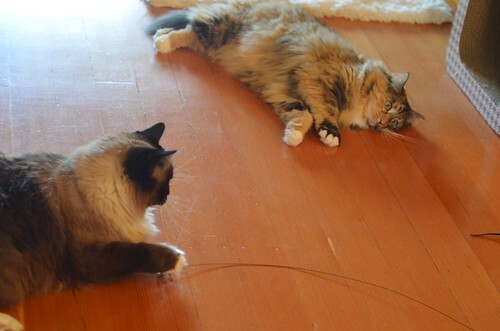 The Itty Bitty Kitty Committee: Tea with Bean (and Wylla) and Cindy! Tea with Bean (and Wylla) and Cindy! 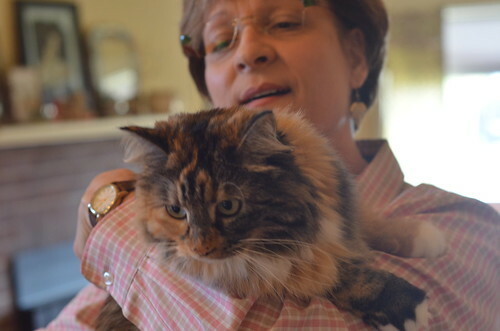 Cindy, who came all the way from the Los Angeles area, joined us for Tea with Bean (and Wylla) on Tuesday afternoon. The day was warm and bright, and it really was the perfect Northwest fall day. Cindy arrived at noon, we all said hello, she met Wylla and Bean, and we spent a little time chatting in the living room. Wylla let Cindy give her a hug, but Bean always needs to really get to know someone before she'll accept that kind of affection. Instead, Craig held Bean. 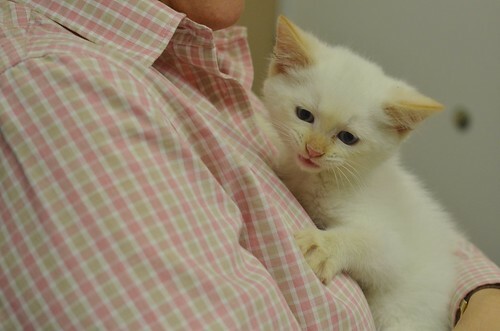 We headed into the kitten room next, and Cindy got to meet the Framboise Family. They were all friendly and sweet and were happy to meet their new friend. I was a little worried Enzo might dash into the shadows, but he didn't! 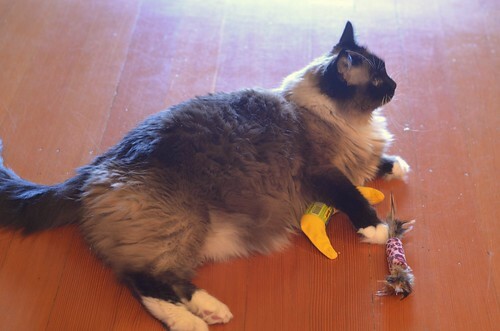 He was comfortable and relaxed and enjoyed playing with Cindy, Cleo, and Posey. While they played, I slipped out of the room to tend to some lunch details, and once everything was complete, we sat down at the table. The "centerpiece" on the table was a collections of items from our 2016 FUNdraising set. Tegan and Dinah manned the phones. 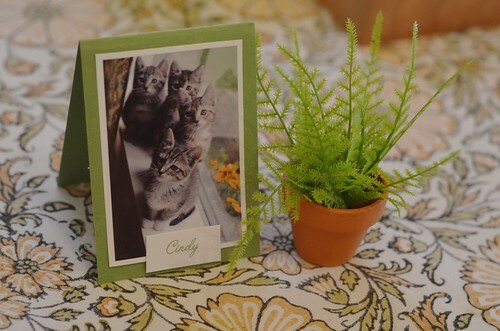 Each place setting had one of the tiny ferns along with a place card featuring one of the images that had hung on the set walls. 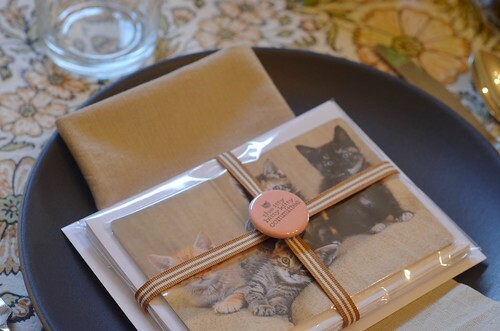 At Cindy's place setting, we had a little gift for her: a couple of sets of kitty cards, an IBKC pin, and a Bean print. We started out with salad and soup. 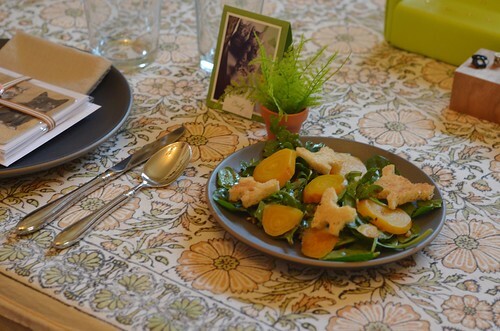 The salad was baby spinach and arugula with roasted yellow beets, a stone ground mustard and maple dressing, and yes, garlic kitty croutons! I loved how the beets looked like striped kitty balls! The soup was pesto with navy beans and kale. Sprinkled on top, a little parmesan and toasted pine nuts. 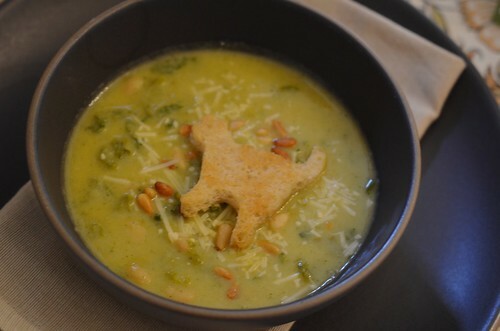 I didn't notice until I imported the photos, but the parmesan kind of makes it look like the kitty is shedding in the soup! And those pine nuts are shaped like mice! For the main course we served cannelloni filled with butternut squash, ricotta cheese, and kale, with a fontina cheese sauce. On the side, roasted rainbow carrots tossed in olive oil, saffron, salt and pepper. And, of course, there was tea. We had a great talk over lunch and enjoyed getting to know our guest. After we were finished, we headed over to the shelter for out tour. Shelby, who does events and marketing at the shelter, was our guide. We first visited the adoptable cats. 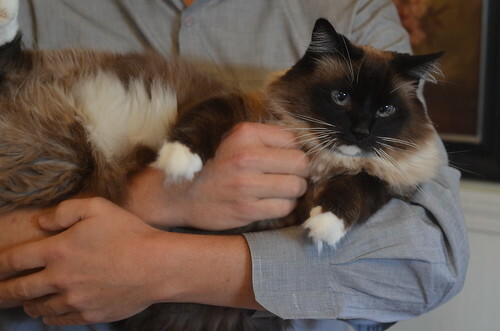 This handsome guy, Albert, was one giant love and was happy to receive attention from all of us. It's hard to see, but his tongue is sticking out here, and we laughed that this guy could very well be Mr. Framboise! 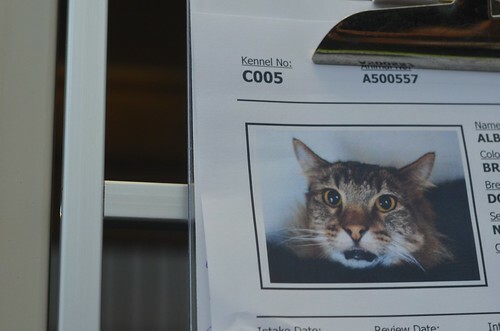 We also laughed when we noticed that in his photo, he looked more like a squirrel than a cat! In the grooming room, where the Bath Brigade works their magic, we got to say hello to this cutie! In the foster room we got to see six teeny tiny babies, three orange and three brown tabby, who were just six days old. Mama Cat was cuddling up with them in the corner of their cage, so I couldn't get a good photo, but gosh, they were itty bitty! 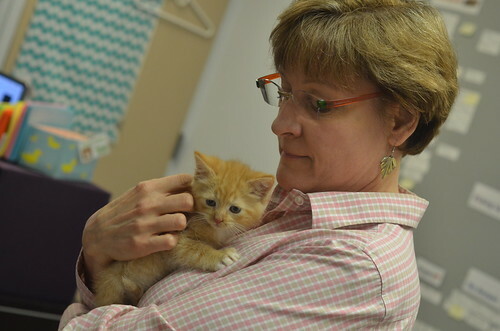 Patty, who works in the foster room and also fosters kittens, had her set available for snuggling. 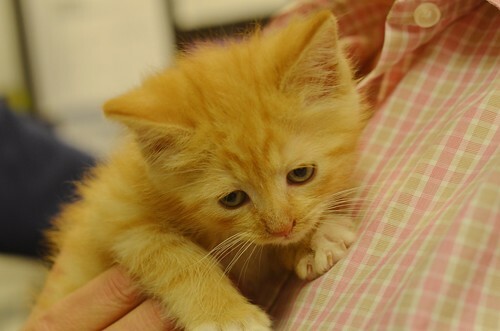 There were three kittens in this batch -- two orange tabbies and a flame point. All were adorable! We visited a few more areas, met some staff, the wrapped up the tour by taking some photos with Bean! 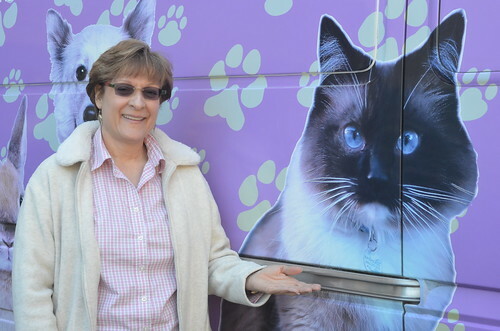 As most know, she graces the side of the Humane Society's "Tail Wagon". Next, we headed back home and had a little more kitten time. And then we had a little dessert. 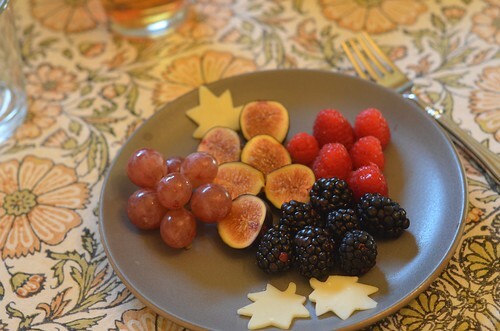 Cindy said she would be happy with just some simple fruit for dessert, so that's what we did. We were so full from lunch, I don't think we could have handled anything much heavier. Of course, their were raspberries, because Framboise means raspberry in French. (In case you didn't know that already!) Also red grapes, figs, black berries, and a little cheese, too. Cindy brought presents for us! She gave me a lovely scarf she had knitted, and the girls got a bag of really awesome toys. 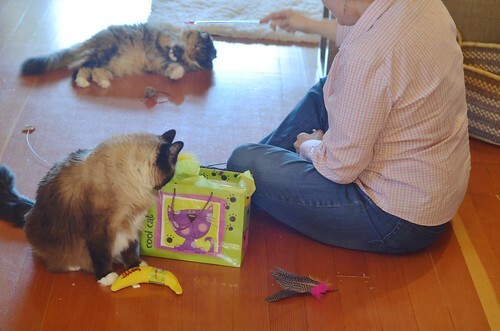 They were excited to receive a pair of catnip bananas (there's nothing better than a fresh banana), a Cat Dancer, a replacement bird for their Da Bird toy, and lots of other fun stuff. 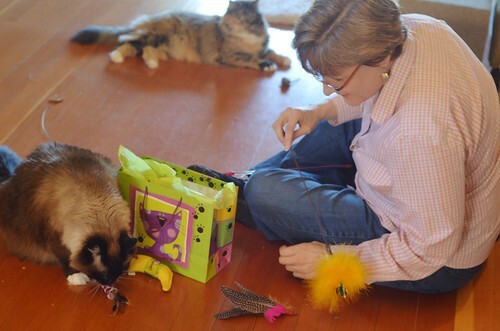 We spent some time trying out the new toys and the girls had a blast! We played with the toys and chatted some more, then ended our day. 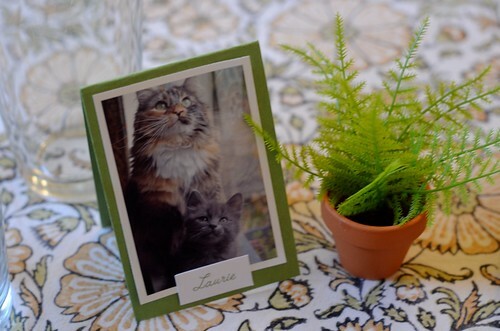 It was a really lovely afternoon and the humans, cats, and kittens enjoyed it immensely! Thank you, Cindy, for joining us! We appreciate you coming so far to spend an afternoon in our home! 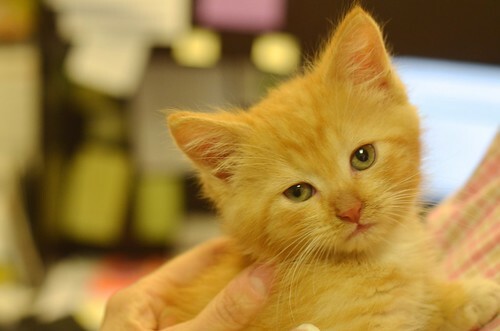 We also appreciate you bidding so generously to win this luncheon with us, and I know the Humane Society does too! They can do many good things with your generous donation! And thank you for all of the wonderful gifts, too. That was so very thoughtful of you! We hope you enjoyed the day as much as we did! Safe travels, and should you find yourself in Tacoma again, do let us know! So, Cindy - can you tell us just how soft Miss Wylla is???? And did The Bean allow a soft pet? Inquiring minds want to know. Wylla is super soft! So is Bean. And they both have lovely full coats, and bushy tails. A lovely luncheon, as always. No wonder the beauteous Bean was so tired last night! Such a beautiful feast, each year it looks so yummy. would love to have you as a personal chef !!! Also: kittens!! The little trio with the 'sad' eyes? Daww. What a wonderful day! Sounds fabulous! 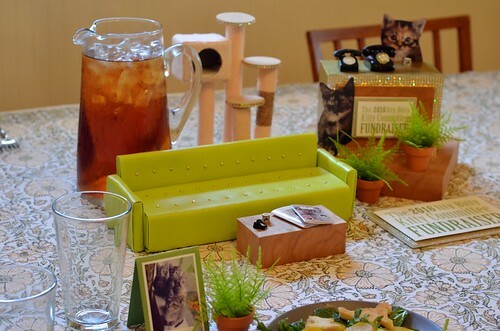 Love using the fundraiser set as table decorations. One of my favorite things when you kick off the telethon every year is seeing what the new set looks like. That also looks like an awesome 3-tiered channel ball toy! What a lovely day! This is lovely icing on the FUNdraiser cake! I can never get enough of your settings and the presence of the IBKC's who staffed the phones so capably. 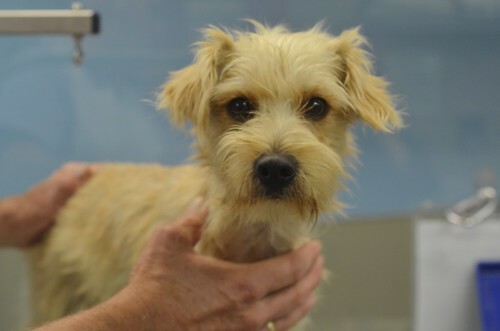 And Patty's foster babies are just too too much with those solemn gazes. So very many wonderful moments for Cindy (and us virtual attendees). Sounds like you all had a wonderful time. 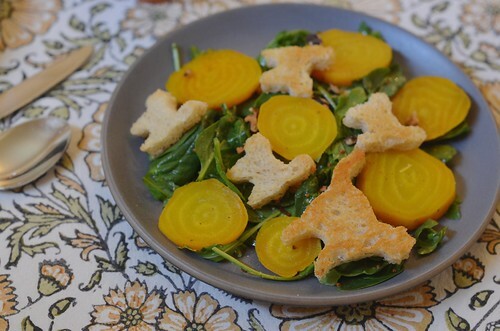 Where did you get cat croutons? Did you make them yourself? I like the shedding cheese in the soup. I made them!! I sliced the bread and cut out the cats with cookie cutters, then brushed with melted butter and garlic and baked. 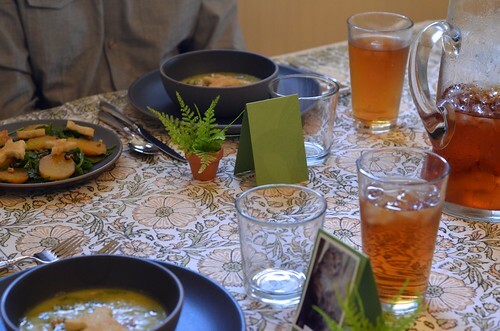 This post is second to me only to the holiday party post (which I believe is an another blog). These two events highlight Laurie's incredible creative talents. This one is the intimate event, the holiday party is the over-the-top holiday decor that I wish I could have or create. Sadly, Zeke and Clementine would love to tear it all down. I hope to see this event this year! 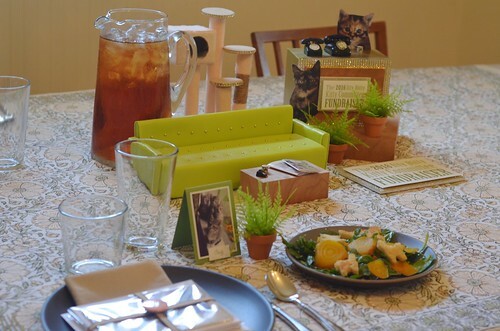 What's better than a day centered around lunch with fellow cat lovers and lots of kitty lovin'? Not much, I don't think! Very lovely! I love how much effort you put into everything. It looks like you made it a very special day. Off topic, how do you roast your beets? I love beets but preparing them has been difficult and I get inconsistent results. The last time I tried I applied some vegetable oil and wrapped each one in foil then baked for 2.5 hours at 300 (these were end-of-season softball-sized beets). They turned out so tender my knife was going through them easily. I'm wondering if there is an easier way. It's the first time I ever tried roasting beets. Basically, I did it the same way you did but with smaller beets and less time.